What is small cell lung cancer (SCLC)? What are causes and risk factors for non-small cell lung cancer and small cell lung cancer? Is it possible to have non-small cell lung cancer and small cell lung cancer at the same time? What are the signs and symptoms of non-small cell lung cancer and small cell lung cancer? What tests do health care professionals use to diagnose non-small cell lung cancer and small cell lung cancer? What are the stages of non-small cell lung cancer and small cell lung cancer? What are treatments and medications for non-small cell lung cancer and small cell lung cancer? What is the prognosis of non-small cell lung cancer and small cell lung cancer? Is it possible to prevent non-small cell lung cancer and small cell lung cancer? Non-small cell lung cancer (NSCLC) is composed of three types of cancers that originate from lung tissue. The three types are known as adenocarcinomas, squamous cell carcinomas, and large cell carcinomas. Adenocarcinomas are slow-growing cancers that usually first appear in the peripheral or outside areas of the lungs; it occurs more often in smokers, but it's the most common type of lung cancer in nonsmokers, too. Squamous cell carcinomas usually occur in the center of the lungs and often develops in smokers, while large cell carcinomas occur anywhere in the lung tissue and grow more rapidly than adenomas or squamous cell lung carcinomas. NSCLC types account for about 80%-85% of lung cancers. Small cell lung cancer (SCLC) is different from NSCLC because it almost always begins in the bronchi, the airways in the center of the chest, and it is rarely seen in people who do not smoke. SCLC rapidly spreads (metastasizes) to other organs much faster than NSCLC types, and microscopically, SCLC are composed of much smaller cells. SCLC can be fatal in a few weeks if untreated, in contrast to most cases of NSCLC with metastases. SCLC counts for about 15%-20% of lung cancers. In addition, SCLC has only two stages (a system used by doctors to define the extent of spread of a cancer), while NSCLC is staged differently with another staging system (TNM, see staging below). NSCLC and SCLC are similar in that they both are lung cancers and they are diagnosed with most of the same tests (see diagnostic section below) and have essentially the same risk factors for development, most notably, smoking. In general, treatment methods (for example, chemotherapy, surgery, and radiation) are similar although different drugs may be used. The major cause of NSCLC and SCLC is tobacco smoking; this cause and risk factor may account for as many as 90% of all lung cancers. For SCLC, about 98% of patients have a history of tobacco smoking. Other factors that may play a role include arsenic exposure, radiation exposure, and/or exposure to environmental carcinogens. SCLC has the most aggressive growth of all lung cancers, with a median survival time of only two to four months after diagnosis when untreated. (That is, by two to four months, half of all patients have died.) However, SCLC is also the type of lung cancer most responsive to radiation therapy and chemotherapy. Because SCLC spreads rapidly and is usually disseminated at the time of diagnosis, methods such as surgical removal or localized radiation therapy are less effective in treating this type of lung cancer. When chemotherapy is used alone or in combination with other methods, survival time can be prolonged four- to fivefold; however, of all patients with SCLC, only 5%-10% are still alive five years after diagnosis. Most of those who survive have limited-stage SCLC before treatment. In non-small cell lung cancer (NSCLC), the most important prognostic factor is the stage (extent of spread) of the tumor at the time of diagnosis. Results of standard treatment are generally poor in all but the smallest of cancers that can be surgically removed. However, in stage I cancers that can be completely removed surgically, five-year survival approaches 75%. Radiation therapy can produce a cure in a small minority of patients with NSCLC and leads to relief of symptoms in most patients. Although it is relatively rare, it is possible to have a mix of small cell/non-small cell lung cancers in one individual. other symptoms or syndromes such as SIADH (syndrome of inappropriate antidiuretic hormone), Horner syndrome (eye changes on one side of the face), and others. Both cancers utilize similar tests for detection. After your doctor takes a medical history and physical exam, chest X-ray, CT scan, or magnetic resonance imaging (MRI) and/or positron emission tomography (PET) may be utilized. In addition, sputum cytology, needle biopsy, thoracentesis, bronchoscopy, ultrasound, and biopsies of other tissues may be used to localize and/or identify the lung cancer type and stage. NSCLC is staged differently than SCLC. NSCLC utilizes the system termed TNM, in which T describes the size of the primary tumor, N describes the spread of the cancer to regional lymph nodes, and M indicates whether the cancer has metastasized. SCLC is staged into two categories; limited stage indicates SCLC is only located on one side of the chest and can be treated by radiation and chemotherapy and rarely, by surgery, while the other stage termed extensive stage means that SCLC has spread throughout the lung to the lymph nodes or has metastasized to other parts of the body. Unfortunately, about two-thirds of individuals with SCLC are first diagnosed in the extensive stage in which usually chemotherapy alone is the best treatment option. Chemotherapy, radiation therapy, and less frequently, surgery may be utilized to treat NSCLC or SCLC. Treatments and medication are individualized for each patient. You and your doctors (oncologist, pneumonologist, surgeon, radiologist, and other team members) need to discuss what options may be best for your individual problem. Unfortunately, the prognosis for NSCLC and SCLC varies from fair to poor. However, NSCLC has a better survival rate with a relative five-year survival rate, depending upon how advanced the disease is at diagnosis, of about 55% for localized disease, 27% for regional lymph node disease, and 4.2% for distant metastatic disease. SCLC is usually diagnosed (two-thirds of SCLC patients) in the extensive stage. For the third of patients with limited stage, appropriate treatment can lead to a five-year survival rate of about 12%-15%. For patients in the extensive stage, even with treatment, only about 2% are alive after five years. It is possible to reduce the risk of getting either NSCLC or SCLC. The best action to take is to never smoke tobacco. If you do smoke, quit now. Avoid secondhand tobacco smoke. Avoid exposure to potential carcinogens such as radon, toxic chemicals, and sources of radiation. Most health care professionals also suggest that you eat a diet containing lots of fruits and vegetables and further recommend daily exercise. Tan, W. "Non-Small Cell Lung Cancer." Medscape. May 24, 2018. <http://emedicine.medscape.com/article/279960-overview>. Tan, W. "Small Cell Lung Cancer." Medscape. May 29, 2018. <http://emedicine.medscape.com/article/280104-overview>. 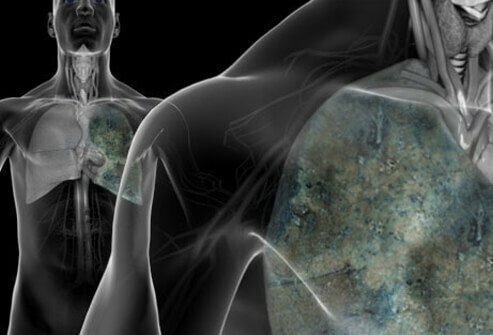 What are the early signs of lung cancer? What are the causes? What are lung cancer screening tests? Take the quiz to find out? Please share your experience with NSCLC and/or SCLC. What signs and/or symptoms did you have with NSCLC and/or SCLC? Please share your NSCLC or SCLC prognosis. Learn about lung cancer myths and facts. Explore how cigar smoke, menthol, and pollution can increase your risk of lung cancer and learn what to avoid. Cancer of the lung, like all cancers, results from an abnormality in the body's basic unit of life, the cell. See a picture of Lung Cancer and learn more about the health topic. Lung cancer is the number one cause of cancer deaths in both men and women in the U.S. and worldwide. Get the facts about lung cancer with this quiz.